Greater tuberosity fractures which are displaced >5-10mm either superiorly or posteriorly can lead to painfull malunions with loss of function. Displaced greater tuberosity Fracture is pathognomonic of a longitudinal tear in the rotator cuff at the rotator interval between the supraspinatus and subscapularis tendons. Greater tuberosity fragment is pulled superiorly by the supraspinatus / infraspinatus. If displaced >5mm into the subacromial space a mechanical block to abduction and forward elevation can occur. Fragment may also be pulled posteriorly by the teres minor and infraspinatus which can lead to contracted external rotators and posterior capsule. Generally complain of shoulder pain after a fall. Swelling and ecchymosis in shoulder which can expend into chest wall and down arm. Point tenderness in the area of the greater tuberosity. Document NV exam, especially axillary n.
A/P of glenohumeral joint, scapular Y, axillary. Greater tuberosity fragments are usually displaced either superiorly or posteriorly. CT helpful to identify exact location of greater tuberosity fragment and its donor site. MRI should be consider if a very small fragment is associated with marked weakness of the rotator cuff. Very small fragments can be associated with large RTC tears. 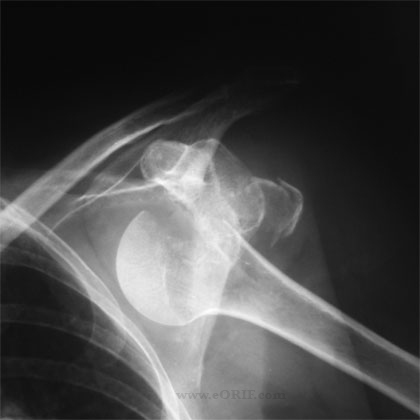 Nondisplaced / Minimally displaced ( <5mm displacement): Sling, start PT within 2 wks for passive ROM only. Start strengthing, active ROM after fracture union is evident. Displaced avulsion fracture: double row or suture bridge construct. Split fracture: ORIF with plate and suture fixation. Depression fracture: generally stable = non-operative treatment. Consider MRI to r/o rotator cuff tear. Anterolateral incision similar to that for a mini-open RTC repair. Deltoid muscle is at junction of anterior and lateral deltoid. Can is taken to ensure the deltoit split does not extend >5cm from the acromion to avoid injury to axillary nerve. If split is >4cm place a stay suture in the deltoid to prevent propagation during retraction. Fracture is reduced and fixed with 4.0mm cancellous screws and washers, or #5 non-absorbable suture depending on fracture size and comminution. All holes in the greater tuberosity should be drilled to ensure no further fragment cominution occurs. Repair rent / close the rototar interval. Consider doing acromionplasty depending on PT age and acromial shape. Evaluated fracture stability through a ROM. Bankart lesion: young athletes with anterior dislocations and greater tuberosity fractures can have associated Bankart lesions which generally require repair. Malunion: Superiorly displaced malunions can produce a painful block to forward elevation. Posteriorly displaced malunions can produce a painful block to external rotation. Patients are placed in a shoulder immobilzer with an abduction pillow (Ultrasling) post-operatively. Pendulum, elbow, wrist, hand ROM is started immediately. F/U at 7-10 days to remove sutures, check xrays and start passive ROM in physical therapy. Active ROM and strengthening are started after xray evidence of fracture healing. Return of ROM and strength can take 6months to 1 year.